As a larger lady (size 16-18) the Summer can be a bitttt of a nightmare (slight understatement maybe?) the problem is i absolutely love the sun and warm weather but hate baring my bingo wings for all to see. The perfect summer solution? The kimono! Luckily for me, kimonos are absolutely everywhere right now and well and truly bang on trend! Perfect hey! They are lightweight and easy to throw over pretty much anything and anything whilst still keeping me reasonably cool! I have three, however i am always on the look out for more. Totally unplanned, but all of mine are actually from New Look. I think new look is pretty much right on point at the minute, and usually find that it pretty much is through Spring/Summer with gorgeous pastels and pretty florals. 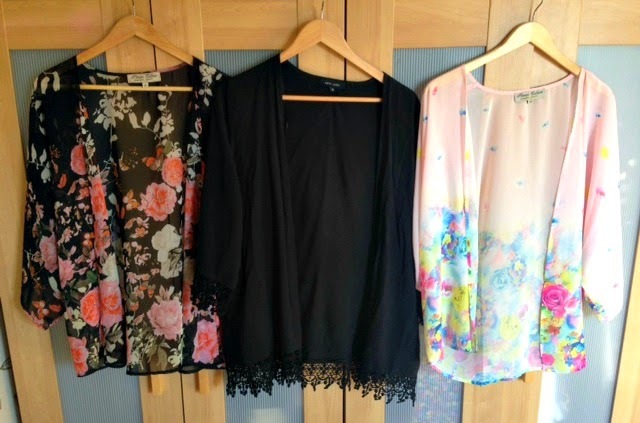 The first one i own is a black lightweight one that is a sort of semi sheer chiffon material with red and pink flowers covering it. It is from the Parsian range and can be bought here for £19.99. The second one is black cotton with a crotchet cuff and hem however it is out of stock on the website. For reference, as the sheer ones have quite wide sleeves i was able to get a size 14 so they are slightly a bigger fit than normal. Whats your thoughts on the kimono? Perfect Summer cover up? I love kimonos, i live in them haha! Review: Ray Ban Sunglasses & GIVEAWAY!